For more than two decades now, SUVs have been one of the most popular styles of vehicle on the road. If you want to combine the multipurpose functionality and utility of a typical SUV with luxury and comfort, INFINITI has the perfect solution. Once you know this is the type of vehicle you want to drive in Mandeville, LA, you’ll say, “I want to shop for an INFINITI QX60 near me.” There are so many features and elements to love about this vehicle. Come see what makes it so amazing. The QX60 has a little something for just about any driver in Mandeville, LA. This four-door SUV comes in a front-wheel drive or an all-wheel drive as well as a continuously variable-speed automatic transmission. It has a gas engine and seats seven people. In addition, it comes with a four-year/60,000-mile warranty. It’s important to choose a fuel-efficient vehicle, especially if you plan on driving it frequently. Gas prices are high today, but when you decide, “I’m going to shop for an INFINITI QX60 near me,” you’ll get an SUV that takes you far on each fill-up. It has a 19.5-gallon tank and gets 22 combined miles per gallon. You can drive 370 miles on city roads, where it will get 19 miles per gallon. You’ll also cruise for 507 miles on the highway before you need to fill up again. The QX60 gets 26 miles per gallon on the highway. This powerful SUV wouldn’t do its job without a reliable engine. You shouldn’t have trouble navigating any roads in Mandeville, LA, and getting up to highway speed quickly. This vehicle has a 3.5-liter, 24-valve, V6, DOHC engine. It generates an impressive 295 horsepower at 6,400 rpm and 270 foot-pounds of torque at 4,800 rpm. It also has variable valve timing and has a turning circle of 38.7 feet. You’ll love the fact you’ve decided, “I want to look for a new INFINITI QX60 near me.” This SUV provides the comforts and conveniences you want most in a vehicle. Some of these features include cruise control, keyless ignition, a leather steering wheel, and three-zone climate control. You’ll also make good use of the rearview camera and the tilt and telescopic steering wheel. 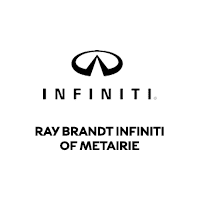 Stop searching all of Mandeville, LA, and get to Ray Brandt INFINITI. Tell the staff, “I’ve been looking for an INFINITI QX60 near me, “ and a sales associate will hook you up with the ideal model.